Today was supposed to be my day off, but instead I started the day with an 8:30am meeting with the IT Faculty. We met to discuss whether I could help out with any of their Media classes… After discussing my background qualifications and going through my portfolio, they asked me if I could do a training lecture on Web Development (AJAX / SPRY) specifically for the entire IT Faculty tomorrow! Additionally, I will be sitting in on five more classes (per week) and contributing where possible. Fun stuff! After my morning with the staff, I quickly made my way to the basketball court. After about a 30 minute set, the girls basketball team took over the court for their practice. As I still had plenty of energy, I headed out for a one-mile run through the city. As I was heading out, one of the guys on the track team decided to join me, so he did his best to pace himself and I did my best to keep up… Hanging out with 18-year-olds is no joke! After the run, another court opened up and I was able to play ball for another 45 minutes before I was dead. After my ice cold shower, I spent the rest of the evening working on my lecture slides for tomorrow’s training class. 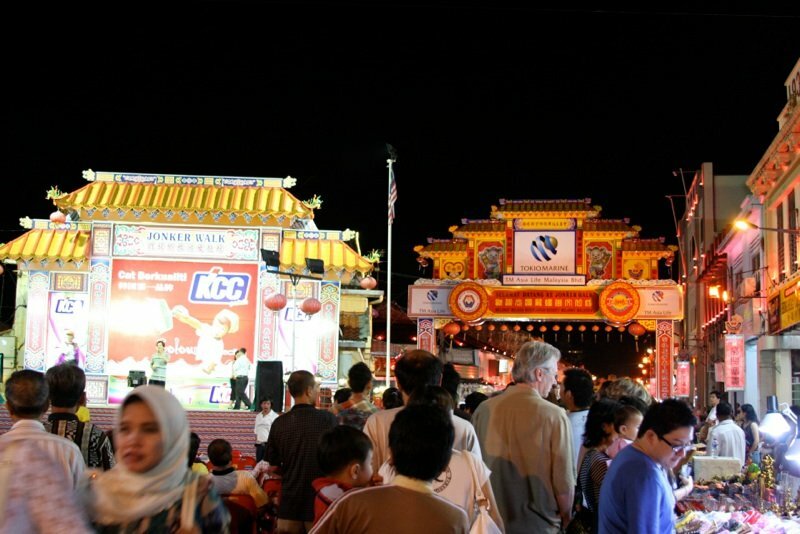 Then, around 9:00pm, I headed over to the night market at Jonker Walk that happens every Friday/Saturday/Sunday night. Essentially, the night market consists of a ton of random stands selling everything from watches to toys to coin collections to old record albums. On top of that, there are a plethora of food vendors, not to mention all the shops, restaurants, cafes, and bars on the street are also open. (picture above). Anyhow, as I hadn’t eaten all day, I was in search of food. Unfortunately, I’m still not familiar with much of the local cuisine, so I didn’t know what I was looking for… After about an hour of cruising, I settled on a stand that was selling bowls of soup called “Laksa”. It turns out the stuff is delicious! Thin noodles, thick noodles, veggies, tofu, and tons of spices! And all for about $1.00!